Today we brought home 18 straw bales, in two loads, and could easily use 18 more, but I'm baled out for the day. The trick is to place them where you want them. 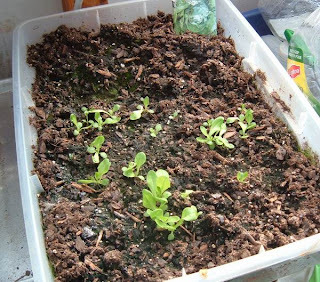 Never plan on moving them 1) after they are wet at all; and 2) after they are planted. The first will break your back and the second will break your plants. First I wasn't sure if they are meant to be planted sitting with the raw side up, or the flat compacted side. Ended up going with the flat compacted side. 50-50 chance that's wrong -I'll let you know. Then I couldn't decide how to arrange them. Started with a long line, like outside walls. 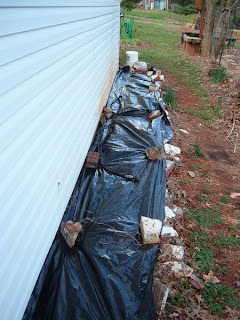 then realized the drip hose has to run along the top, and it would be more efficient not to have walk-through breaks. So currently they are set serpentine style. This may change. Started looking for legume inoculant, which is harder to say outloud than you would think. i want to plant peas and beans in some of these bales, and the inoculant is a bacteria that gets sprinkled on the top to help the root systems convert nitrogen in oxygen into nitrogen for their roots. Kindof like making it out of thin air. This will eliminate the need for additional fertilizer. Found it online, but am going to try one more local place on Monday to save the shipping cost if possible. Also got the remainder of the plastic down - this will be a pepper bed I think - it's the lower side of the blueberry patch. Peppers love black plastic and the warmth it gives their roots. Also got the plastic down next to the garage bed. Somehow I forgot to get the straw bales for this area. 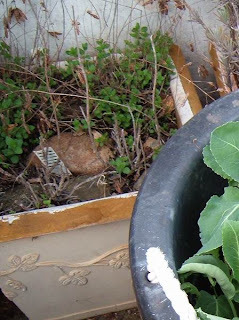 For the last several years, whatever I plant here (cukes, cauliflower, broccoli) have been eatten alive. Only in this bed though, making me think it's some insect that winters over in the soil, then pops up to find I've planted it a smorgasbord breakfast. Like the big garden, this small patch can bake over the summer, and kill whatever lives there. Meanwhile the straw bales will grow cukes galore. A few volunteer onions are up -this bed needs revitalizing this year. 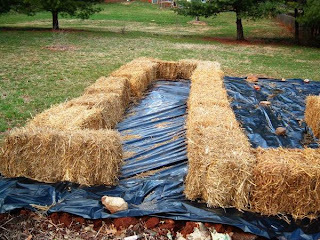 I may just do plastic here and bales too -it's cool and shady even at the height of summer -might be a great place for lettuce. 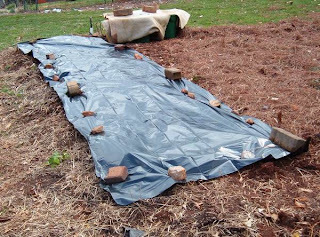 Speaking of lettuce, I also ordered the shade cloth for the greenhouse this afternoon. It's cloudy, and low 60's today, but it's 100 degrees in the greenhouse. The shade cloth coming is 60% black woven meaning it should cut 60% of the UV and sun, so I can continue growing some crops in the greenhouse this summer. 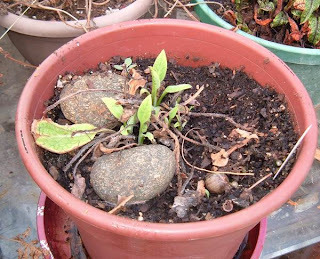 The pot of comfrey is coming up. 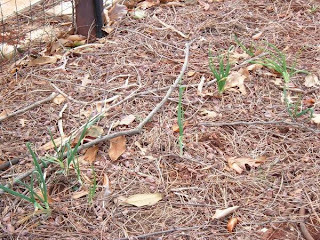 I want to plant a bed of this somewhere in the yard this year -this plant lasted until January, and provided leaves for the water bucket. 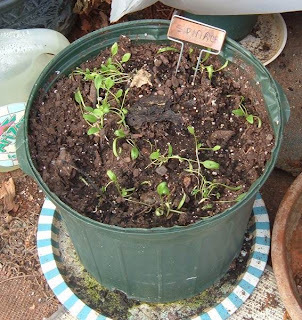 Comfrey leaves in water makes a great fertilizer, plus it's a prime ingredient for comfrey salve. 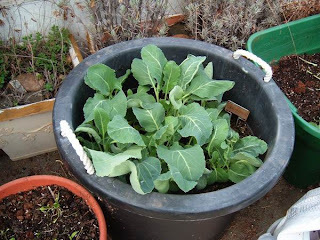 The cauliflower plants are almost ready to set out. In back of the cauliflower, the Sicilian Marjoram is coming back. I've decided to plant large amounts of marjoram, basil, oregano and sage this year to mix my own Italian seasoning. Lettuce taking it's leisurely time to get big enough to eat. We may starve before this is large enough. 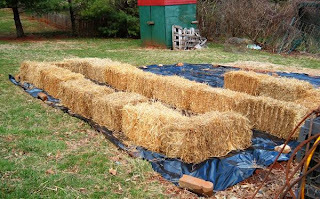 Plus the more I look at those photos of the straw bales, the more I think I'm going to rearrange them. Perhaps a T-design.